I have a confession: I don’t really like museums. Actually, that’s not true. I adore museums for maybe half an hour at a time. Food and drinks help. A lot. In fact, if I could do museums in half hour intervals studded with food and drinks all day and night. I lived in Florence, Italy one memorable summer, and went to the Uffizi just about every single day, each time discovering something new and precious. 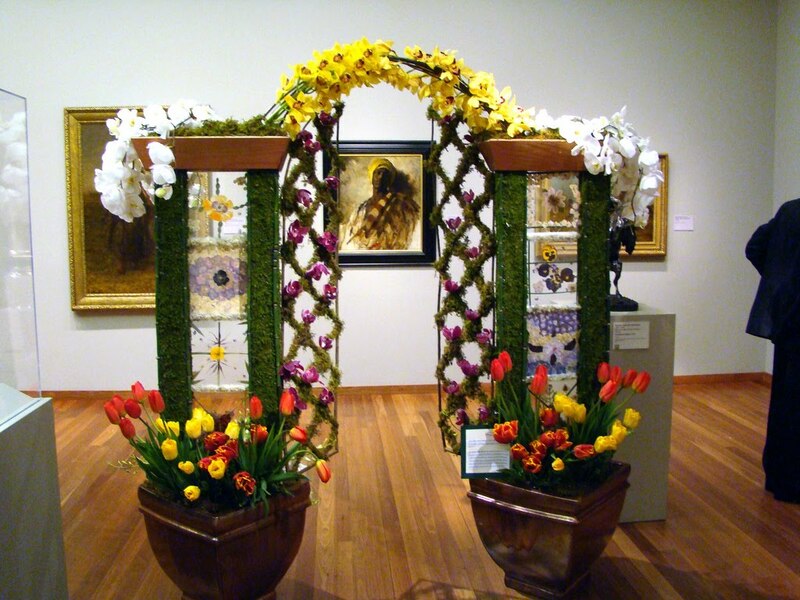 But all that said, I’d like to put in a plug for a great museum experience: the annual Bouquets to Art show at the DeYoung Museum in San Francisco, which comes only briefly, usually in March. If you haven’t been, it’s a little hard to describe. Essentially, this fundraiser invites florists and artists –artistic florists, really—to create pieces that respond to particular paintings. Then these pieces are presented in front of, or next to, those paintings. Sometimes the arrangement mimics something from the painting. In other cases it reflects a shape or color. 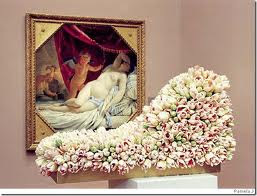 And at times the floral representation simply responds to the mood of the original art work. 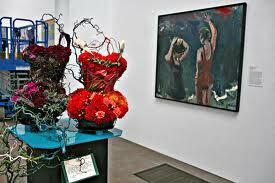 What I love about Bouquets to Art is the vibrant, time-limited interaction of the viewers with the artwork. The show invites the artist/florists and the viewers to take part, to interact, to see anew. The flowers live only briefly, so the show only lasts a few days. But that very brevity adds to its charm. Because sometimes museums are best savored in small doses. Wow what a fascinating exhibit-- I am always a little sad after visiting art museums because I would LOVE to be able to create/paint/draw but I am horrible at it. Seriously. I've tried. i have never heard of this! what a cool idea - and i would LOVE to see it someday! They do the same thing here in San Diego, we only have a small and not too good Museum, but it is facinating to see how the "Floral Artists" interpret the Art Work. I have the same feelings in Museums, sensory overload. They are best visited in small doses to better absorb what you feel. I also enjoy lecturing to the uninformed. And I make up what I do not know. That is the most fun, try it sometime.everyone will think you are the most brilliant scholar in the world.